Ring in the new year in Wichita! Like the idea of a themed New Year’s Eve party? Want to LOL on the last night of 2016? Looking for live music to accompany your midnight toast? Planning to wind down the year by having dinner out with friends? Hoping to find a New Year’s Eve activity the whole family can participate in? 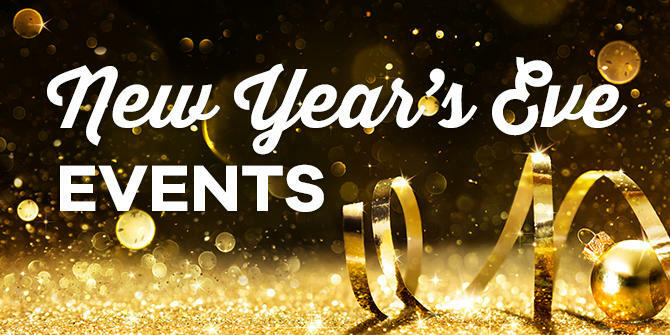 Ring in the new year in Wichita – we’ve got New Year’s Eve events to meet a range of styles and budgets. Boogie into the New Year at Hyatt Regency Wichita. Put on your disco pants and jive to the Lucky People Band, playing disco and contemporary music. A one-night stay package for two is $279 and includes dinner buffet, NYE party, breakfast buffet, parking and late checkout. Tickets are available for dinner and dance only ($75) as well as dance only ($30). All packages include a toast at midnight and there will be a cash bar available. Ring in the New Year at Wichita Marriott. Purchase packages for $195-$280 that include overnight accommodations, dinner buffet, party favors, NYE party, breakfast buffet and late checkout. Enjoy live music from Private Stock, the ultimate dance band from Kansas City. There are dinner/entertainment packages for those not needing a room: $100 per person. All packages include a toast at midnight and there will be a cash bar available. The Ambassador Hotel Wichita, part of the Ambassador Hotel Autograph Collection, is hosting an exclusive evening with entertainment from Curtis the Mentalist early in the evening and The Source Band, a high-energy party band. Tickets are $99 for the NYE festivities in the hotel’s Regent Room or $139 for a five-course tasting dinner at Siena Tuscan Steakhouse and the party. Overnight packages are also available. There will be party favors, a cash bar and a champagne toast at midnight. Guests can also enjoy The Study cocktail bar and conversation room or listen to The Roberto Bernardinello Jazz Trio from 7 to 9 p.m. in the new Dockum Apothecary, the new speakeasy-style bar in the basement of the hotel. Don&apos;t miss your chance to ring in the new year with country star Logan Mize! Mize&apos;s Road to a Good Time tour stops at Club Rodeo on New Year&apos;s Eve, and he&apos;ll get you dancing and singing along all through the night. Stay at Club Rodeo until midnight to see a 5,000 balloon drop! Grab your cowboy boots and cowboy hat to step into the new year with Logan Mize! Tickets are $20 in advance, $25 at the door. The Cotillion is hosting an all-ages ’80s-themed rock concert featuring two bands on New Year’s Eve. The Astronauts (formerly known as The Naughty Astronauts) is a high-energy dance band from Wichita. With a song list full of some of the best songs of the 80s and a few newer hits as well, they will get you dancing early and keep you moving all night. The music and spirit of the 1980s is captured on stage by the band Paramount, with amazing sound and light production. Named after the Paramount Bar in Salina, Kansas, the band recreates the soundtrack of a decade with all the rock hits from Journey, Motley Crue, Poison, Joan Jett, Prince and more. From 5 to 9 p.m. every Friday and Saturday, Hotel at Old Town features live jazz performed by local talent in its Keen Kutter Bar and New Year’s Eve is no exception. No cover. Join the crew at The Donut Whole for a New Year&apos;s Eve celebration featuring a few zany flavors of their fresh made donuts, a new art exhibit by Zachary Ledbetter and live music by singer-songwriter Derek Behtivegna. Derek has been performing nationally since 2001 and is best known for his powerful bluesy vocals and poetic lyrics. His unique style of finger picking and percussive acoustic rhythm guitar playing is accessible to a wide range of music lovers. Dance to the music of Groove 42 or tap your foot to the music while trying your luck at the slots and table games at Kansas Star Casino. The band, a Wichita party band that plays hits from the past two decades, will play from the new Tin Lizard Bar & Grill starting at 9:30 p.m. The casino’s Kitchen Buffet and Woodfire Grill will have extended holiday hours. Following the show, the casino will countdown to the new year with free party favors and a New Year&apos;s toast! Barleycorn’s has put together a double-bill of local, edgy music for New Year’s Eve. Carrie Nation & The Speakeasy is a “high-energy, acoustic brass n grass” 5-piece band from Wichita that plays to packed bars and festivals across the country. They are excited to celebrate NYE in their hometown and will surely turn up their eclectic blend of punk and bluegrass. The second act, The Travel Guide, has been described as having “a certain edge and breath of maturity,” and is “instantly recognizable” to those who have seen their shows. Tickets are $11 in advance, $15 day of. The show is 9 p.m. to 2 a.m.
Wichita’s comedy club, The Loony Bin, is hosting two shows on New Year’s Eve. Come out early and enjoy the 7:30 p.m. show open to ages 18 & older for $16 per person. The late show at 10 p.m. is for ages 21 & older and the $28 per person ticket includes party favors, a champagne toast at midnight and a party until closing time! Comedian Tracy Smith has honed a hilarious insight on how to navigate the mean streets of Womandom, carrying all of her middle-aged baggage in a tightly packed carry on. With a personality just sweet enough to offset the bitter truth she dishes out, Tracy allows us all laugh out loud at the rough roads ahead of us or behind. Smith is one of the most respected voices working in stand-up comedy today. Her television appearances include NBC&apos;s “Late Friday,” her own special on Comedy Central and appearances on HBO and A&E. She is also a favorite on the Bob and Tom Radio Show and toured with the “Bob and Tom All Stars. Prairie Rose&apos;s special New Year&apos;s Eve chuckwagon starts with horse-drawn wagon rides and classic cowboy movies from 5 to 6:15 p.m. The all-you-can-eat chuckwagon supper is at 6:30, followed by the Oklahoma Balladeer, Les Gilliam, who will perform great cowboy songs. Then be ready to get up and dance to the music of Rusty Rierson & the Forever Young Band! The celebration will wrap up around 10:30 p.m. Tickets are $45 per person. Join Venue 332 at Wichita Scottish Rite and American Rose Theater for an enchanting and magical evening. Your night will start with a fancy dinner fit for a king and a queen. After dinner, join the company in the theater for a fairy tale themed burlesque show. The night isn&apos;t done yet; bring in the new year with a burlesque ball (black tie attire), dancing the night away with Rudy Love’s band. Tickets range from $30-$300 depending on which elements of the evening you want to participate in and whether you want overnight accommodations. Join Mosley Street Melodrama for a one-night New Year’s Eve performance: Rockin&apos; & Ringin&apos; in 2017. The cast will perform their favorite songs and skits from the 2016 season, along with hilarious surprises! Doors open at 6:30 p.m. with a buffet provided by Pig In Pig Out Barbecue. Show begins at 8 p.m. $50 per person or $380 for a table of eight. Roxy&apos;s Downtown won&apos;t tell us what they&apos;re planning for New Year&apos;s Eve, but they promise it will be an event you&apos;ll never forget! Bring your favorite group of friends to a hilarious and unforgettable show at Roxy&apos;s Downtown. The Olive Tree likes to ring in the new year Mediterranean style – with friends, family, music and plenty of food! Olive Tree will have a dinner buffet, live music and a champagne toast at midnight. Start a new family tradition by celebrating at the Olive Tree. If you&apos;ve been searching for a place to celebrate the New Year with your family, the Alley is putting on the perfect family-friendly New Year&apos;s Eve party…twice! They have two sessions: 6:30 to 9 p.m. and 10 p.m. to 12:30 a.m. The early option is $90 per lane and the late option is $100 per lane – both allow up to six people per lane. The package includes unlimited bowling (shoe rental included), go karts and laser maze play during the session, as well as pizza and a pitcher of soda with unlimited refills. Run in the New Year 5k is a running event and holiday celebration extravaganza! The race starts at 11:45 p.m. at the Wichita Boathouse. This race is an opportunity to RUN into 2016, literally! Each participant will receive a commemorative custom beanie hat, race shirt and finishers medal. The Wichita State University men’s basketball team plays host to the Bradley Braves at 1 p.m. on New Year’s Day at Koch Arena. The roundhouse will be rockin&apos; for this Missouri Valley Conference matchup, so get your ticket now!